As much as I love to share, I like to take these kind of events to learn something too – especially when it matches the theme of my blog about Norway; our culture, traditions and habits. Like I told you in my post about this parade last year; In 852, Olaf the White, the Ainhlabh of the Irish chronicles, descended from the same family as Harold Hårfagre (the Fair-Haired), the first King of Norway, conquered Dublin (Dubh Linn; “Black Pool”), with the adjacent territory, and founded this, the most renowned, most powerful and most lasting Norwegian kingdom in Ireland. This corresponded to most of present-day County Dublin. Norse Rulers of Dublin were often co-kings, and occasionally also Kings of Jorvik in what is now England. The region was known to the Vikings as Dyflin, pronounced “dyoov-lin” (in either Old Norse or Modern Norwegian). The English later took Old Irish “Dubh Linn” and collapsed it to the modern “Dublin” and some still use “Divlyn”. Maybe some of you recognise on person in the middle of this picture? There was hundreds participants in the parade and even more spectators along the parade route. Everyone supporting and feeling a bit ‘Irish’ (also wearing something green) that day. They showed a warm hearted patriotism, just the way I like it: not to demonstrate power or superiority … but pure happiness and passion for the country and culture they love and care for. I got the 17th of May (Norwegian National Day) feeling and of course I’ll get back to that in two months. How fun. I so love St. Patrick’s day. Glad you had a great time. I love that you met up with the girls in the parade. Looks like such a great cultural event and again why I think I miss out so much here in North America.. OR maybe it’s also the fact that if you try to go to an event here, it’s too crowded 90% of the time to even call it enjoyable.. I believe in networking you know and yes; it was a great parade. Will you be drinking any green beer? Great photos! I can spot my daughter and myself in one of them :-) Happy St Patrick’s Day today. Thanks for stopping by – always great to see new readers. Happy St Patrick’s day to you, too, Renny. I love the St P’s parades and usually go every year. This year I missed out as I am unable to stand for too long at the moment. Glad you have the fun of the Parade in Oslo, too. Thanks and I’m sure its a big event in Australia too. Hope you’ll feel better soon and get another chance next year. We had a nice day too, even if it was cold as h*** to play the pipes…. I can imagine it was cold to play – hope you did not catch a cold…. that was really interesting. i knew there had been a lot of norse invaders to ireland but learning the history of the name “dublin” was new and fun to learn. thanks for sharing once more. it looks like it was a great time. How flattering; to have readers learning is one aim of my blog you know! Good that I sit ! I didn’t know that you too celebrate St. Patrick’s day ! I thought they only do it in Ireland ! It’s celebrated all over the world where there is Irish people I guess. It’s interesting to see how another country celebrates this day. I’ve got corned beef and cabbage cooking up with carrots and potatoes! I think it is too and hope you had a good one as well. Sounds delicious and a perfect traditional dish for the day! Your welcome – the aim of my blog to have readers learn something you know. 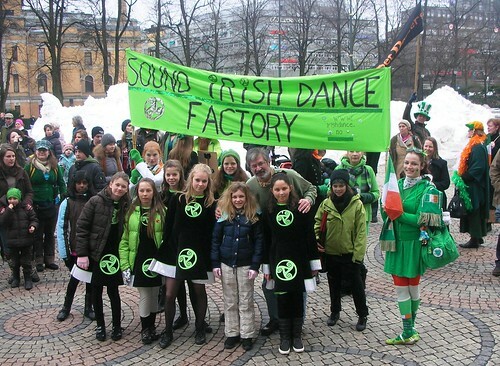 thanks for sharing this year again St Patrick’s Day in Oslo with us! Watching the diaporama I imagine how nice the parade was! St Patrick looks very nice! I know this man on the picture and more I think I will see him in a few months with a band of vikings!!!! You’re welcome and as a regular, I know you saw my post from last year too. So you recognised me!! yea, we’ll see you in a few month – invading France!!!! Great pics! I missed the parade in London, but took some nice pictures at the festival, some of which have made it onto my blog. Amazing! I wouldn’t have thought there would be so much St. Patrick’s Day celebration in Norway! This is fun! I’m part of the band, actually I’m one of the tenor drummers (the one you walked in front of while filming). I didn’t know it was you though, as we’ve only met online earlier. :) Nice to “meet” you! I do agree; It’s fun and goes with my saying: Blogging connecting People! Its about time we “meet“, don’t you think!?! Btw: Thanks for your nice words and link love on your own post! It was a bunch of fun – you really should do it next year! Looks like a lot of fun. Is there a significant Irish community in Oslo? Or just a bunch of locals having a fun day? i never imagined st. patty’s would be this fun! now i wish i can join in all the fun,too, but we don’t have the parades and green stuff in asia. hehe. thanks for sharing renny! you took good pics. Looks like St Patty’s Day is celebrated all over the world! Awesome! All of you seem to have more fun than our locals. Belated Happy St. Patrick’s Day (I know your wife also celebrates it) :D! I remember reading last year’s post, right here in your blog, and I must say that I prefer this year’s: it seems to have more colour: it is gorgeous! I recognised you in the photo (how could we miss you? ): it is so sweet, with the kids [loved their outfits]! I love Ireland, and I haven’t been there in a long time, but it is an amazing place to go to! Great steak beef! Thanks for this colourful post; I loved it! 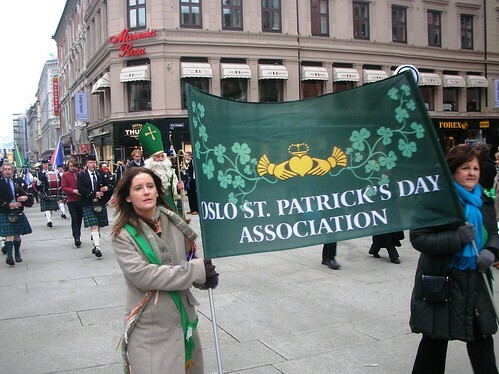 for reasons you know, I was not able to watch the St Patrick festivitaes in Oslo this year. But, you solved the problem with this unique report. btw. my stortå is feeling a little better and we are off for Essen this weekend. Have an unique weekend in beautiful Spring Weather. Still celebrating St Patrick’s Day? hehe…. yeah,sure!we do recognize the “cool” guy in the middle of the last pic!LOL! i enjoyed viewing the slideshow,Renny!Thanx for sharing us one of your cultures,as usual! thanks for sharing your pics. I was there too. Yeah, can´t believe it. Great pictures and it looks like fun ! Wow, looks like you had a great time. St. Patrick’s day is so much fun, one of my favorites. I loved all of the pictures, you are real good with photography. I think you have missed your calling to be a photographer. EVERYone is Irish on St. Paddy’s Day! One of my favorite celebrations! Nice article and photos. For your information though, “Dyflin” was pronounced “Dublin” in Old Norse (and modern Icelandic) as the letter “f” when followed by “l” was pronounced as “b”. For comparison, the international airport in Iceland, Keflavík, is pronounced “Keblaveek”. When is the parade this year? I’ll be coming over from Iceland next week and am wondering if it’s worth sticking around for. The Toyota hybrids didn’t have that problem, because they had a different accelerator pedal supplier, and because its control system would override the accelerator whenever the brake was pressed.